In this construction video tutorial one can learn about why minimum shear reinforcement is arranged in beam and column for the reinforced concrete structure. Simple or Direct Stress – It is categorized as tension, compression and shear. Indirect Stress – It is categorized as bending and torsion. All these types of stresses are generated in beam. 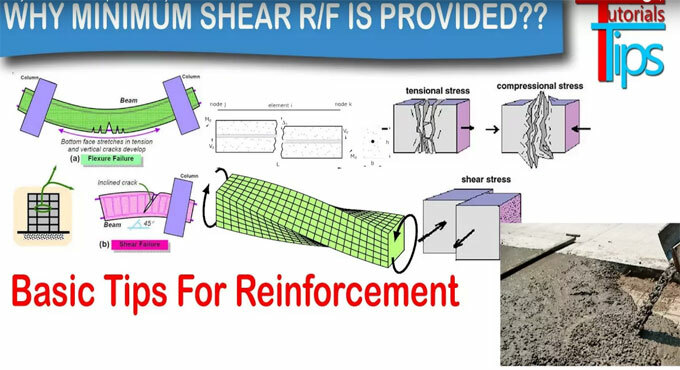 But, in this video focus is given on why there should be minimum shear reinforcement in beam. A shear stress is generally defined as τ (Greek: tau). It refers to the component of stress coplanar having a material cross section. Shear stress takes place from the force vector component parallel to the cross section. Shear stress originates from shear forces, which are pairs of equal and opposite forces operate on opposite sides of an object. To withstand any crack occurs because of creep and shrinkage. To make the ductility of beam superior. To make better dowel action. Alternatively, enhance the bonding among various materials or members with primary reinforcement. To gather more vital information on this topic, go through the following video.